This collection looks back at times forgotten. Visitors can view items on display which include artifacts, documents, photographs and memorabilia of Scotts Hill days gone by. Tours may be arranged to accommodate walk ins, students, organizations and other special occasions. This collection is intended to be a community project of the Scotts Hill area. Community members are welcome to display their items, if only for a limited time. The Historical Board invites anyone to see the collection and welcomes comments from the community on the preservation of the community‘s history. Any items presented for display must be a part of or exemplify a significant time in the Scotts Hill area history up to 1986. With the limitation of space, some items may not be accepted. Items can either be loaned or donated to the city. Credit can be displayed with item if desired. Items loaned can be retrieved by their owner with proper verification. The Town of Scotts Hill or its representatives will take the best care possible with loaned items and cannot be held responsible for lost, damaged or stolen items loaned to the town. Historic photographs given to the town for possible addition to the collection can be immediately copied, at no charge if staff and equipment is available. Copies of pictures is not available to the general public. Pictures being accepted must be of the Scotts Hill area, with central focus on street scenes, Churches with buildings as main focus, schools, former mayors and prominent leaders of times before 1986. Donations can be accepted for the benefit of the historical collection. 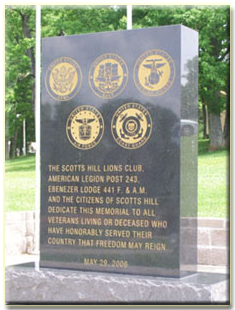 A monument in honor of all veterans, living or dead, is located in Scotts Hill City Park. Over $10,000 was raised spearheaded by the Scotts Hill Lions Club. Money was donated by other organizations, clubs and organizations. 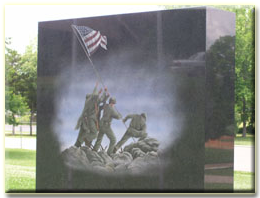 The monument was dedicated May 29, 2006 at 2 pm. The Tennessee Air National Guard and the Air Cavalry Squadron began the program with a flyover. 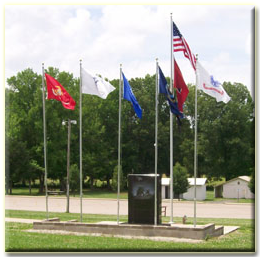 Flags representing each branch of the military and a military armament piece is planned to acquired to be placed in close proximity to the monument site. A concrete walkway has been built from the parking area. The six person committee for this project was Joel Pierce, Jerry Taylor, Gordon Scott, Bill Snider, Wayne Stanfill and Harley Walker.